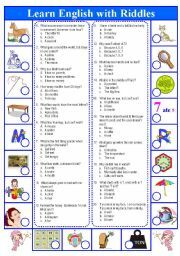 A collection of funny riddles to entertain your students! With keys! Hope your students will enjoy it! Again! 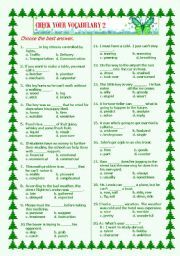 It�s a WS that I use in my reading class. Hope your students will love it. I use this WS in my reading class. It makes my students learn and laugh. They asked me for more. 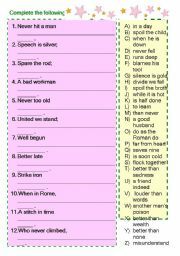 Students have to complete the proverbs by choosing the missing part on the right. 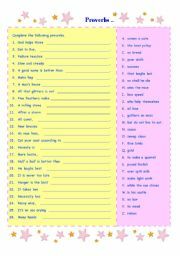 Students have to complete the proverbs by choosing the missing word or words on the right. Here comes again with English Jokes. Hope your pupils enjoy it! Ihis is the vocabular test that I have just made for my pupils. Hope it is useful for you. Hidden in each word is an animal, fish, bird, or insect. Some animals are easy to find and others are more difficult. Some words contain two animals. Let�s your students enjoy this! Teachers can use this PPT as a game between two teams. Teachers can use this in their classrooms. I use this to review the antonym in my classroom. My students like it a lot. 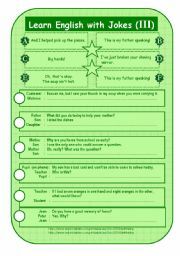 Teachers or students can use this to review all the tenses in their classroom. It�s cool. My students enjoy having it in class. It�s how to prepositions of time. 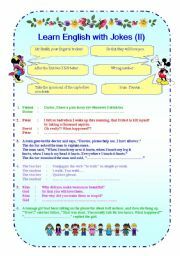 It�s good for teachers to use in the classroom and students who want to do the exercise about the preposition of time. My students like it a lot. Which is not in a group? I use these slides to review the vocabulary in my class. 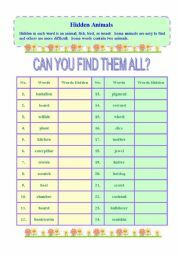 Students have to find out which word is different from others and tell why. Then the teacher just give another click to show the answer. There are 30 slides. 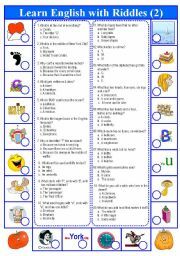 Hope it�s useful for your students. It�s how to use prepositions of time.